I still collect East German (GDR) passports whenever I find them interesting and affordable but that you find passports of former government members is truly rare. Here comes one of them. 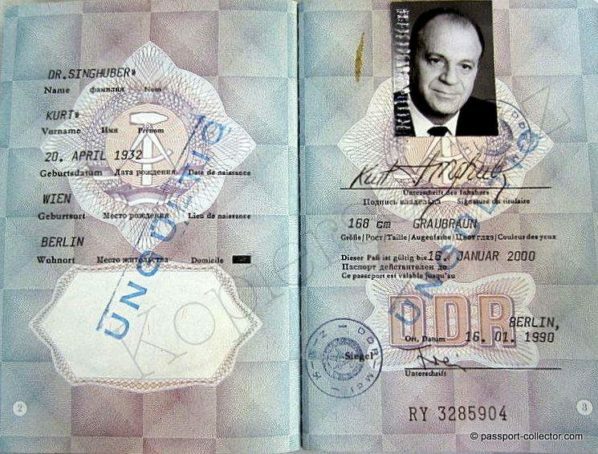 Kurt Singhuber (* 20 April 1932 in Vienna; † 15 October 2005 in Berlin) was a German politician (SED). He was minister of ore mining, metallurgy and potash of the GDR. This is now the fourth “high ranking” politician I have in my archive. Singhuber was born as the son of a working class family in Vienna. After his birth, the Singhuber family went to the Soviet Union, where his father worked in the aircraft industry. When the Singhubers (according to the German-Soviet non-aggression treaty) had to leave Moscow, they were arrested at the border, sent to a “re-education camp” and subsequently assigned a residence in Halle (Saale). He attended high school from 1942 to 1950 and graduated from high school. In 1945 he became a member of an Antifa Youth Committee and in 1946 a member of the FDJ. In 1949/1950 he was chairman of the local group Wildau of the FDJ. After training as a skilled worker in mechanical engineering at VEB ABUS Wildau, he studied at Dresden Technical University until 1952 and at the Metallurgical Institute in Dnepropetrovsk until 1957. He graduated with a degree in engineering. From 1957 he worked as a design engineer and from 1959 to 1961 was Technical Director at VEB Heavy Machinery Construction “Heinrich Rau” in Wildau. From 1958 he was a member of the Central Working Group for Research and Technology “Rolling Mill Equipment” and from 1963 for “Iron” of the GDR Research Council. After distance learning at the Hochschule für Ökonomie Berlin with a degree in economics, Singhuber was an aspirant and lecturer at the Technical University “Otto von Guericke” Magdeburg from 1961 to 1964. From 1961 to 1965 he was Technical Director and Plant Director of VEB Schwarzmetallurgieprojektierung Berlin. In 1966/1967 he was deputy minister for ore mining, metallurgy and potash. In 1967 he was awarded his doctorate in engineering. From 1967 Singhuber was also an associate member of the GDR Research Council and head of the GDR delegation to the Standing Commission on Black Metallurgy at the Council for Mutual Economic Assistance. From July 1967 to November 1989 he was Minister of Mining, Metallurgy and Potash of the GDR. From 1968 to 1973 he completed distance learning at the Karl Marx Party College at the Central Committee of the SED, graduating with a degree in social sciences. From November 1989 to April 1990 he was finally Minister for Heavy Industry in the Modrow government. From 1978 to 1990 he was Vice-President of the Chamber of Technology.